An initiative to help Gaeltacht secondary schools provide a wider range of subjects to pupils through the Irish language has been launched by Minister for Education Joe McHugh. The Gaeltacht e-Hub pilot project will mean that Gaeltacht schools that are not in a position to offer physics to Leaving Cert students through the Irish language will be linked online to a Gaeltacht school that has a physics teacher. Using laptops with a camera and microphone, students will be able to join a class being taught through Irish in another school. The initiative was launched at Gairmscoil Mhic Dhiarmada on Árainn Mhór off the coast of Donegal. 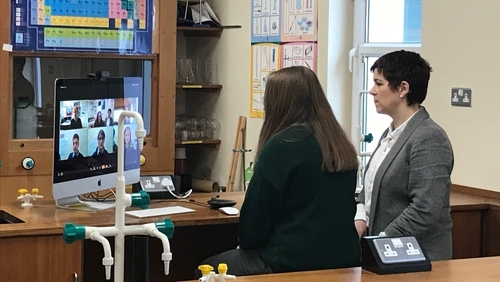 While the first subject to be taught is physics, the minister said that ultimately the innovative project will greatly enhance the capacity of Gaeltacht post-primary schools to extend their curricular provision for the stem subjects - science, technology, engineering and mathematics. The programme has already been tried out among some Gaeltacht transition year students, including Sophie Doherty on Árainn Mhór. She and students in other Gaeltacht schools in Cork and Galway have been taught online through Irish by experienced physics teachers in Coláiste na Coiribe in Galway and Pobalscoil Chorca Dhuibhne in Kerry. Sophie now plans to study physics this way for her Leaving Cert and said it gives her and students in the other Gaeltacht schools more options when it comes to university. Sophie, like more than half the pupils at the secondary school on Árainn Mhór, lives on the mainland but travels by ferry from Burtonport to go to school on the Gaeltacht island every day. The digital programme is now being rolled out on a pilot-basis with e-mentors assisting the students and extra funding for technology in their schools.